Bank on 4 essential web solutions under one roof at Netgen. The 4 essential web solutions under one roof on offer at Netgen is a lot like the 4 seasons in 1 day we experience, particularly in Cape Town – while the clouds are busy giving way to the sun, or vice versa, there is a kind of a grey area that also needs an eye kept on it. What this boils down to is that, for instance, if you’d like Netgen and its talented young team of IT specialists to design a WordPress website or Custom Website in Cape Town or Johannesburg for you, they are able to cross-over into providing you with expert online marketing strategies and more, covering all the grey, often overlooked areas in-between. So, what are the 4 basic solutions to be found at Netgen? Why effortless? The answer to that’s this team has been at it for almost 17 years already, and with the combined knowledge of project managers, online marketing experts and website developers thrown into the mix, it’s easy to see why customers who’ve dealt with Netgen over a long period feel confident about sending anyone they know to this team. They make it look so easy, and their down-to-earth attitude helps too when you’re looking for a great end-product that’s affordable. You bring your ideas (or tired website ready for a facelift) and your budget to Netgen, they’ll work their own brand of magic to put it all together in a way that gives you a visible presence online. Need to automate routine work of employees, store data and information safely and easily to increase efficiency in your business! Netgen has just the answer. They’ll design bespoke custom software that aligns perfectly with their ethos of saving time and money for their customers. Netgen also has their own stable of custom software products available, software developed for Personal Trainers and Swimming coaches, Bulk SMS solutions, Email platforms and Lead Management Solutions, among others. If one of these products is the solution you’re looking for that suits your business sector, you can look forward to software that does what it’s supposed to and comes with full back up support. 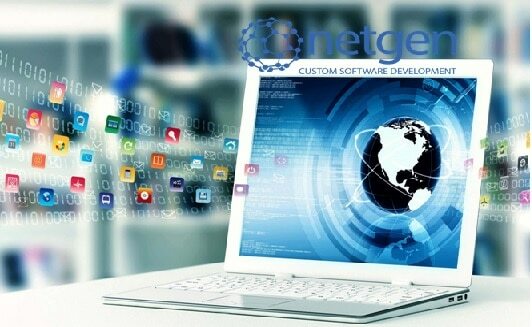 There’s a lot more to it than meets the eye when it comes to refining custom software to fit your business processes like a glove, but, with the knowledge you have of your business, and the experience of the team at Netgen, the final product will be an investment well-worth making. Millions of mobile users demand convenient, fast and immediate access to information and services on their mobile devices every day, wherever they are. Long gone are the days when we would load a wagon up and saddle up the horses for a month long ‘trek’ to the nearest provisions store! New technology is being born every day, and to make sure that you and your business stay on the cutting edge of mobile marketing, Netgen lives on this edge and sees far into the future, developing mobile apps that help to grow your business, create brand awareness and keep you connected with customers 24/7 in the long term. There are a lot of ways to look at marketing solutions for your website. An easy on the eye website is one of your most important marketing tools, but, for it to be ‘seen’ online, is going to require a mix of marketing solutions to suite your unique requirements, to contribute to the growth of an online presence. If you’d like to throw a few extra tools into your digital marketing tool kit, Netgen is only too happy to help you pick the right ones to lead to great rankings on search engines for your brand. An integrated online marketing plan is your best shot at making your presence known exactly where you want it to be known, when it comes up in search results. Add a blog to your site and fill it with content relevant to your business, along with SEO or Google Adwords, among others. With this much on offer from one talented, experienced team of professionals, why even look elsewhere? The enthusiasm at Netgen is contagious, which will make every project you tackle with them an adventure.